Our Courting Justice project provides integrated criminal legal representation to Victorians experiencing or at risk of homelessness. When someone is homeless, they’re more likely to come into contact with the justice system. They’re also less likely to be able to navigate it. That’s why we established our Courting Justice project: to empower clients with complex needs to access justice. In September 2015, we welcomed the first criminal lawyer in Homeless Law’s 15-year history. Since then, we’ve provided civil and criminal legal casework, integrated with social work support. It’s bringing to life the concept of helping vulnerable Victorians through holistic services. What is the Courting Justice project? Justice Connect’s Courting Justice project is part of the integrated model of legal services our Homeless Law team provides. Courting Justice seeks to improve the ability of marginalised clients to access the criminal justice system and to deal with the range of legal issues that accompany homelessness. Through our work, we regularly see homeless or at risk Victorians with intersecting legal and non-legal needs. Our model is designed and run with these needs at the centre, making sure that all clients receive the intensive assistance they need to exit homelessness or stay in safe housing. Our Courting Justice project helped Annabell attend court and avoid getting a criminal record. Justice Connect helps people who are experiencing or at risk of homelessness every day. For complex clients who may slip through the cracks of existing legal services, including rough sleepers, we can provide them with specialised and tailored criminal legal casework, advice or in-court representation. It’s one way we’re better able to provide holistic, integrated support. In the first three years of Courting Justice, we assisted 237 homeless or at risk Victorians to achieve outcomes through the criminal justice system. This included ongoing criminal legal representation for 124 people. 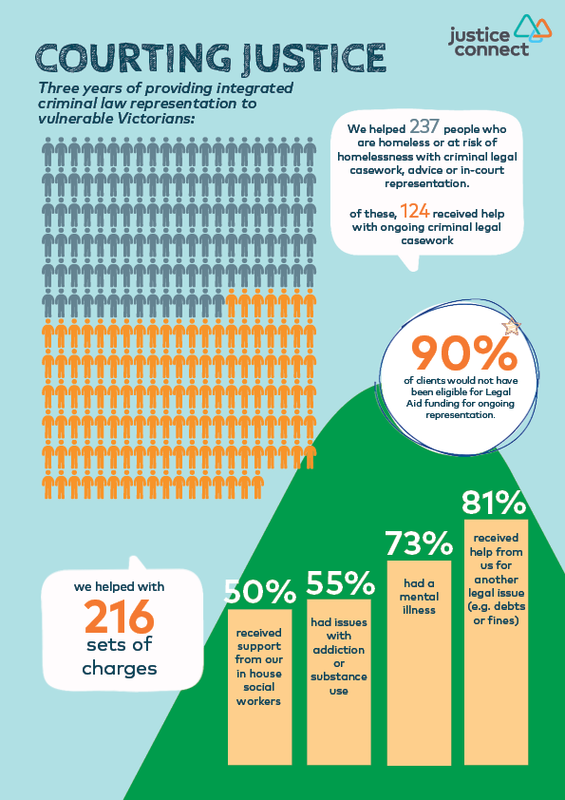 90% of these clients would not have been eligible for legal aid funding for ongoing representation.